When Mary Barra takes over next month as CEO of General Motors, the automaker will become the nation’s biggest company run by a woman (based on GM’s $152.3 billion in revenue last year). But Barra’s ascension won’t much change women’s overall representation in corporate America’s corner offices. 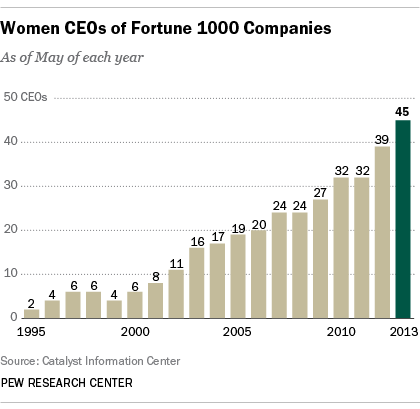 Currently, 45 Fortune 1000 companies have women as their chief executives. There will be 46 women CEOs in that elite group as of January, when Barra takes the reins at GM, Jacqueline Hinman becomes CEO of engineering giant CH2M Hill and Linda Lang is scheduled to step down as chief of Jack in the Box. That would represent an all-time high, according to data compiled by nonprofit research firm Catalyst. A decade ago, only 16 companies on Fortune’s list had women CEOs. Still, that’s less than 5% of the top jobs at America’s top corporations. The picture isn’t much different elsewhere in the executive suite or in the boardroom: Women held 14.6% of senior executive positions and 16.9% of directorships at this year’s Fortune 500 companies, according to Catalyst. Those numbers are essentially unchanged from last year’s 14.3% and 16.6%, respectively. Nationwide, 10% of women describe themselves as the boss or top manager at their workplaces, versus 16% of men, according to a new Pew Research Center report on gender and the workplace. Just 38% of women who aren’t already the boss say they’d like to be someday, versus 52% of men, the survey found. Women’s expressed desire for the top spot varied markedly by age and race, though among all subgroups women were less likely than men to say so. 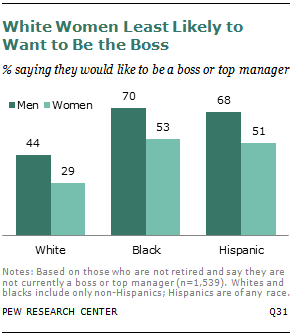 Only 29% of white women said they’d like to be a boss or top manager someday, as opposed to 53% of black women and 51% of Hispanic women. 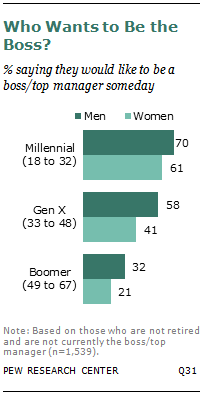 And 61% of Millennial women (ages 18 to 32) said they wanted to be a boss someday, compared with 41% of Gen-X women (ages 33 to 48) and 21% of Baby Boomer women (ages 49 to 67).